The theme of the conference is Inspiration in teaching, learning and playing. This entry was posted in News on 16.9.2016 by Junio Kimanen. Epta-Finland will hold its Annual National Conference at Palmgren Conservatory, Pori on Saturday 6th February 2016. The program includes a lecture-recital about the Finnish composer Selim Palmgren, demonstrations of e.g. group teaching, a student concert of Palmgren Conservatory as well as an Evening recital by Ivari Ilja. Please registrate by paying the participation fee to the bank account of the Piano Teachers’ Association FI55 1014 3000 1414 87 by 7th January 2016 at the latest. The name of the participant should be seen in the receipt of the payment. The participants marked in the list of members of the Piano Teachers’ Association and having paid the member’s fee of the year 2015 may pay the member’s participation fee. NOTICE! Participating in the Piano Conference is free of charge for full-time students of piano pedagogy. 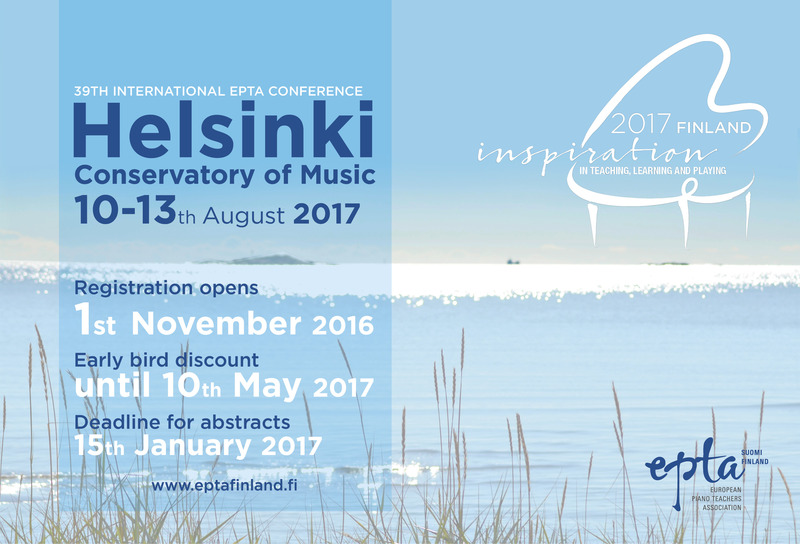 Registration by e-mail is required for the participation by 7th January 2016 to the email address sihteeri@pianopedagogit.fi. Remember to mention the name of your institute. The prices include buffet breakfast and customer´s sauna. Free Wi-Fi in the rooms. The participants should make the reservations by themselves directly from the hotel by 7th January 2016. Remember to mention the code PIA050216 when making the reservation. The statutory Annual Meeting of the Piano Teacher´s Association will be held on Saturday 6th February 2016 at 15h 45 at Palmgren Conservatory, Pori, Rautatienpuistokatu 7, 28130 Pori. The statutory issues of an annual meeting will be dealt with. The rules are available on the website of the association. This entry was posted in National Conference 2016 on 7.11.2015 by Junio Kimanen. Please registrate by paying the participation fee to the bank account of the Piano Teachers’ Association FI55 1014 3000 1414 87 by 7th January 2015 at the latest. The name of the participant should be seen in the receipt of the payment. The participants marked in the list of members of the Piano Teachers’ Association and having paid the member’s fee of the year 2014 may pay the member’s participation fee. address sihteeri@pianopedagogit.fi. Remember to mention the name of your institute. The prices include buffet breakfast and customer´s sauna. Please, notice that the there’s only a limited number of rooms available and the reservations should be made by 7th January 2014. Remember to mention “Piano Conference” when making the reservation. The statutory Annual Meeting of the Piano Teacher´s Association will be held on Saturday 7th February 2014 at 4.00 p.m. at Tampere Conservatory, F.E.Sillanpään katu 9, 33230 Tampere. The statutory issues of an annual meeting will be dealt with and the board members being under resignation the next year will be allotted in the meeting. The rules are available on the website of the association. This entry was posted in National Conference 2015 on 16.1.2015 by Junio Kimanen. This entry was posted in News on 4.3.2014 by Junio Kimanen. Please registrate by paying the participation fee to the bank account of the Piano Teachers’ Association 101430-141487 by 9th January 2014 at the latest. The name of the participant should be seen in the receipt of the payment. The participants marked in the list of members of the Piano Teachers’ Association and having paid the member’s fee of the year 2013 may pay the member’s participation fee. NOTICE! Participating in the Piano Conference is free of charge for full-time students of piano pedagogy. Registration by e-mail is required for the participation by 9th January 2014 to the e-mail address . Remember to mention the name of your institut. The prices include buffet breakfast and customer´s sauna. Please, notice that the there’s only a limited number of rooms available and the reservations should be made by 9th January 2014. Remember to mention “Piano Conference” when making the reservation. The statutory Annual Meeting of the Piano Teacher´s Association will be held on Saturday 8th February 2014 at 3.30 p.m at Metropolia University of Applied Sciences, Ruoholahdentori 6, 00180 Helsinki. The statutory issues of an annual meeting will be dealt with and the board members being under resignation the next year will be allotted in the meeting. The rules are available on the website of the association. This entry was posted in National Conference 2014, National Conferences on 26.11.2013 by Junio Kimanen. Welcome to the translated section of the Finnish Piano Teachers’ Association (EPTA Finland)! We will translate our web pages little by little. Our goal is to offer all the relevant information of the association also in English. This entry was posted in News on 5.11.2013 by Junio Kimanen. The program includes lectures (e.g. evaluation and feedback for students in exams) demonstrations (Anto Pett: Improvisation), concerts, panel discussion (exam policies in different schools) e.g. Evening recital by Jukka Nykänen (the program will include his own transcription from Sravinsky’s Rite of Spring). This entry was posted in National Conference 2014, National Conferences on 5.11.2013 by Junio Kimanen. Program: Lectures, concerts, panel discussions, demonstrations e.g. This entry was posted in National Conference 2013, National Conferences on 5.11.2013 by Junio Kimanen.